Two weeks ago Edward W. Felten was the first speaker in a new series called Comments from Campus — a collaboration between Princeton Public Library and Princeton University that endeavors to bring the campus to the community (or the gown to the town, if you will). We designed it as a lunch time brown bag lecture with the simple concept of inviting faculty to speak about a topic of their choosing and/or discuss their latest research in an informal setting. The topic is not settled beforehand as the idea is to give a platform for current research interests. Unrolling a new program at a public library is nerve-wracking (as I have discovered since I took over as Program Coordinator here at PPL last fall). You are never sure if you will find the audience you are hoping to attract and doing this as a lunch lecture instead of an evening series was a bit of a risk. Our first talk was by all measures a great success and we had better than expected attendance — in large part to the speaker’s repuation, knowledge and also because of his choice of topic. Professor Felten delivered an entertaining and fascinating talk entitled “Real Policy for Virtual Worlds” where he examined a variety of interesting scenarios in which real world government or law may need to intervene in virtual worlds. 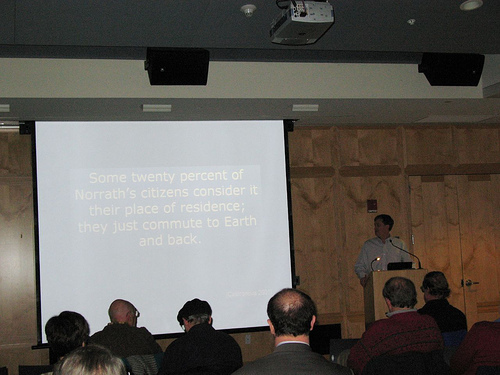 Most of the 46 people in attendance had never even heard of Second Life or Norrath or any other virtual world before. You could see the look of amazement on several faces as they learned about the depth and breadth of virtual worlds. They were especially amazed to learn about Adam Reuters and Anshe Chung and how the Linden dollar can be traded like real currency. The talk was the perfect mix of technology and policy. I myself learned a lot, which was an added bonus because even though I have an avatar on Second Life I rarely spend time there. I have uploaded several photos from the talk on the PPL Flickr account if you would like to get a flavor of the talk — and a few of the other events that have been keeping me from blogging as often as I should. On a side note, you might want to consider adding Felten’s always fascinating Freedom to Tinker to your blogroll — I have long been an avid reader and he always gives me food for thought. Entry filed under: Privacy, Social Web and Social Networks, Tech Trends. 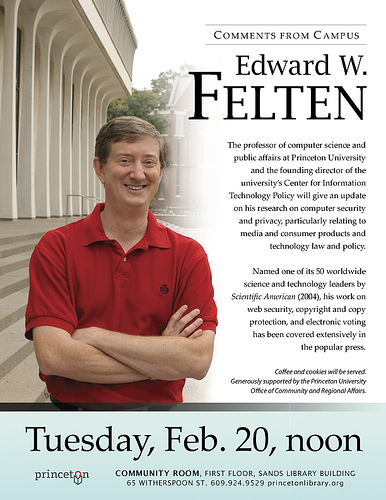 Tags: Edward Felten, Princeton Public Librayr, Second Life, Virtual Worlds. 10 plus 1 questions with Boris Simkovich, Zuula.com	Don’t let the train leave the station without us!